Remember the too.cute.for.school blogging notepad that I showed you all yesterday? Since it's Friday, and I believe in celebrating every Friday in some way, shape, or form, how about a $75 giveaway to shop your heart out at Crystal Faye? Does that sound good to you? I'm not hating it, and hopefully neither are you! +pin your favorite item to one of your Pinterest boards and leave the URL in the comments below! This giveaway will be open until next Friday and the winner will be notified via email. **Giveaways not your cup of tea (get it? get it? see above pic)-use the code "KeepCalm" for 10% off any order! It is also my love, Shay's,"Treat Yoself Day", which you can read about on her blog, so this is the PERFECT way to participate in this girls! PS: This weekend something exciting is happening. We are starting to paint ALL of the trim in our house white!! I couldn't be more thrilled to finally start and I'm not being sarcastic. More on this next week. Wish us luck. love the Be Brave print! and the iPhone cover...if I had an iphone! I love the monogrammed pullover! So cute! LOVE the Eat Blog Love mug!!! That gray monogrammed pullover looks soooo comfy & with the weather getting cooler, I would definitely like to have one of those in my closet! Whether I win or not, that monogrammed, half-zip pullover is mine! Oh my goodness I love all of the things from her shop! I'm so glad I know about it now! 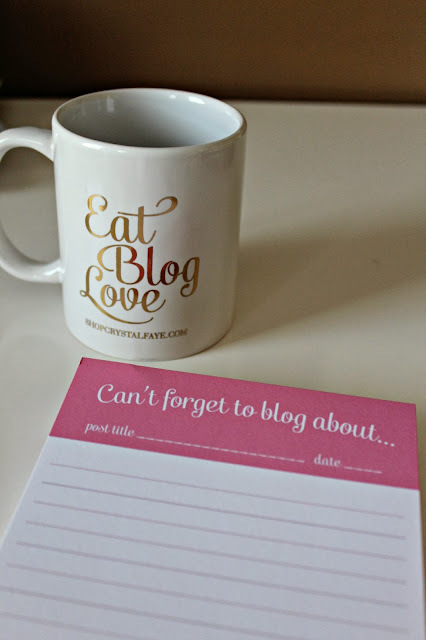 I love the Eat love blog mug and notepad! I love the southern sayings iphone cases! Everything monogrammed! I'm in love! I really love the gray half-zip! I also followed Crystal Faye on Pinterest, and you on Insta (@sp3cia1j) Fingers crossed! I pinned the "Bless your heart" iPhone case! I followed Crystal Faye on Pinterest (Jen Worrell)! I also followed her on Pinterest and facebook plus following you on instagram! I've been eyeing a monogrammed pullover for months and I followed her on pinterest! I'm also an instagram follower of yours! I want the "Oh Happy Day" mug. What a great way to start to the morning! I follow you in IG, I liked her facebook page, and I pinned the mug (http://www.pinterest.com/pin/140385713357859104/) I also followed her on pinterest! I love the happy mug! 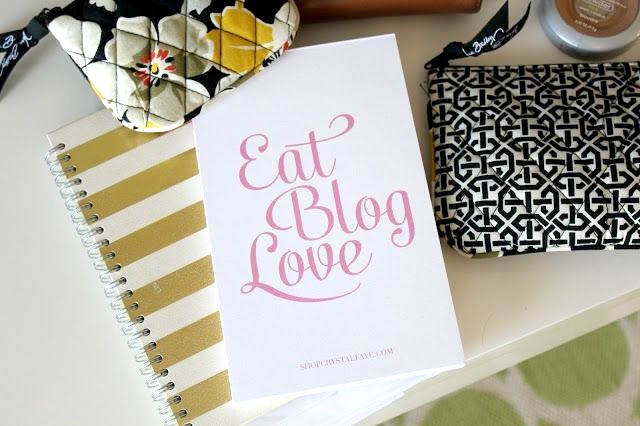 The "What to Blog about" notepad is SO dang cute and I need it now!! I also follow on Pinterest and Insta!! I love the blog mug! followed her on pinterest, twitter and facebook! I also adore the Blair Waldorf print, so cute!! I followed her on Pinterest, Twitter and Facebook and followed you on Instagram. i love the monogram zip up!! and i follow on pinterest :). I love the monogram hat!! I also love the apex jacket in black! I also like Crystal Faye on Facebook! I love the coffee mugs she has! I have a half zip monogram on my Fall want list. And of course, I would need that coffee mug to drink my coffee out of while I wear my monogrammed sweater ;) Love this giveaway! I follow on IG and Pinterest. I love the be brave print. Also became her 1600th follower on pinterest! I love the monogram fleece pullovers! There are way too many things to choose from! I want it all! LOL... I think I will start with the oh happy day mug! New follower here, I'm following so I can vicariously live through your life of no kids ;) Can't wait to see all the fun stuff! I love that Circle Rope Monogram Ring! Would be so cute! I Crystal Faye on Pinterest! I follow KC&CO on Instagram! In love with the confetti iPhone case or the "oh happy day" mug and print! I follow on pinterest and on twitter, liked her page on facebook, and I follow you on instagram! I love the Eat, Blog, Love mug!! I followed on Pinterest, too! IN love with the Eat, Blog Love mug for sure! After that insta-feud with Steph and that chick, she totally needs that phone case!! Bahahahahaha! I love all of the monogram collection, but I especially love the monogram hat! I love the Oh Happy Day mug! And we're in the process of painting our trim white as well! We got 1.5 rooms done and I had to take a break - it's exhausting and such a tedious project! Good Luck, hopefully you like it more than I do! I looovveee the "Oh Happy Day!" mug!!!! I am now following Crystal Faye on Pinterest!! My favorite item is the Oh Happy day mug. I follow CF on Pinterest! I follow CF on facebook. I follow KC&CO on IG. I NEED that mug, favorite thing FOR SURE! Ahh. Love this shop so much. i like the "oh happy day" mug. i love all of these things! My favorites are the eat blog love coffee mug, the iphone cover, and the fleece monogrammed pullover! 1. Both of the mugs in her shop are super cute and I LOVE the flamingo notepad. Super fun giveaway! Thanks for hosting!! I love the bless your heart iphone case! I am a Texan and southern girl so of course, it makes sense! I also love anything monogrammed so this shop is perfect. Thanks for hosting this great giveaway!!!! Love so many things... the monogram cuff, the apex jacket, and the monogram hat! 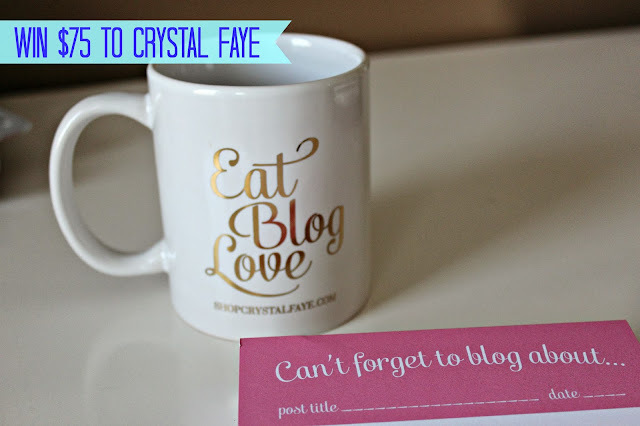 Love the Eat, Blog Love mug the best too! The Need to blog about notepad is GENIOUS!!! Such a great giveaway, thanks for introducing her shop! Love the coffee mug! Following on Twitter now and Instagram too. Great products! The monogram pullover is fab! I love monograms because I just got married in March and love to show off my new initials <3 Everything on the site is totally cute though! Love the "Bless Your Heart" stuff as well! The "Oh Happy Day" mug. I love the little things iPhone case! I liked Crystal Faye on Facebook. Love, love, love, the monogram pullover! I follow you both on on bloglovin, instagram, twitter, and pinterest (I'm obviously obsessed)! I follow you both on pinterest and follow you on instagram!! I love the Monogram Apex Jacket in Navy or white! LOVE it! I liked her on Facebook--Kait Sawyer! Would love the monogram pullover or the coat. I follow Shop Crystal Faye on facebook! Dying for the monogram beach towel! !